With some tinkering in Settings and the help of an app, you can get the old long-press recent apps gesture back from Oreo, which is much faster than the way it works in Pie by default. It does eliminate the gesture controls, but for some, this is the preferred way of managing Android. Combine these steps with our tip to force all apps to support split screen mode, and you'll be easily enjoying two apps at the same, doubling your workflow. 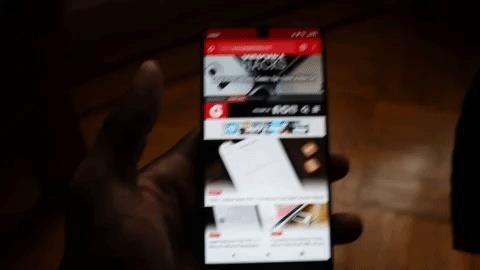 Before Android Pie, you could long-press the recent apps button to trigger split screen mode. If an app was already in the foreground, you could then pick another app from the list to have both running side-by-side. Dead simple. But as you know, Android Pie brought in a new swipe-up gesture to access the multitasking view (Overview). As a result, the recent apps button (the little square on the bottom-right) is now gone. 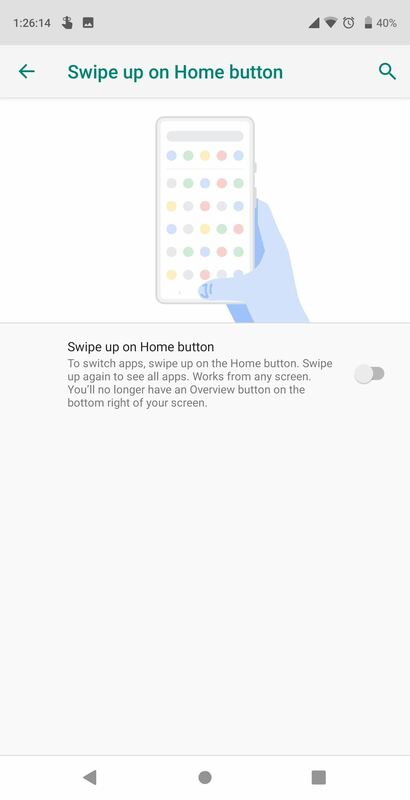 This means that, to enter split screen mode, you now have to swipe up on the home button, tap the icon above an app in the Overview menu, choose "Split Screen" from the popup, then select a second app from the overview menu. Lots harder, right? But we're here to fix that. 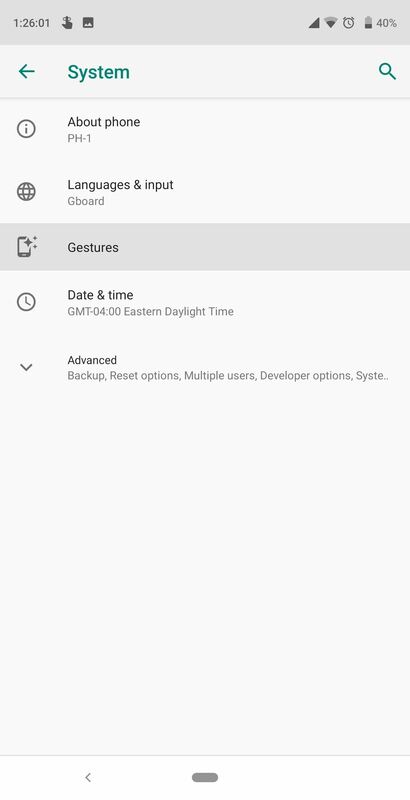 So to simplify the whole process, the first thing we'll need to do is disable Android Pie's gestures in order to bring back the recent apps button. Enter Settings and navigate to "System." Choose "Gestures" and select "Swipe up on Home button." Deactivating this toggle will return pre-Android Pie navigation buttons, including the uniform size and the recent apps button. Usually, bringing back the recent apps button would be all you'd need, thanks to a hidden shortcut. By long-pressing the recent apps button, you could launch split screen mode instantly. But Google didn't bring this shortcut back with Android Pie (even if you disable gestures), and therefore, we need to. To return this shortcut, you'll need to download an app called Split Screen Shortcut. The app is free, on the Play Store, and doesn't require root to use. 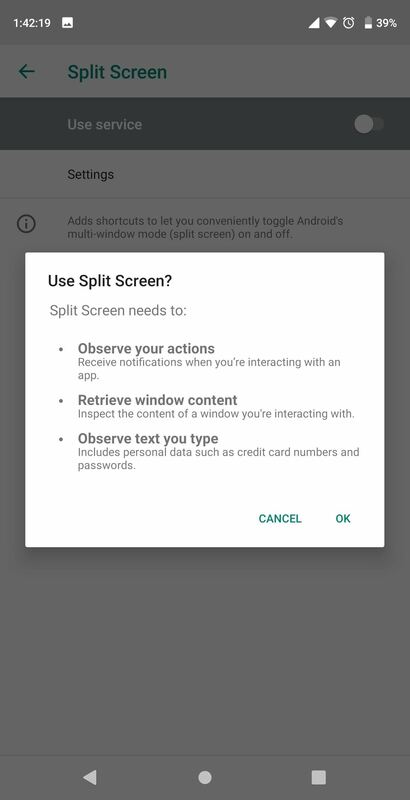 Open Split Screen Shortcut and choose "Split Screen," which is disabled. It will inform you that you need to activate its Accessibility Service for it to work, and there will be a button that directs you to the page. 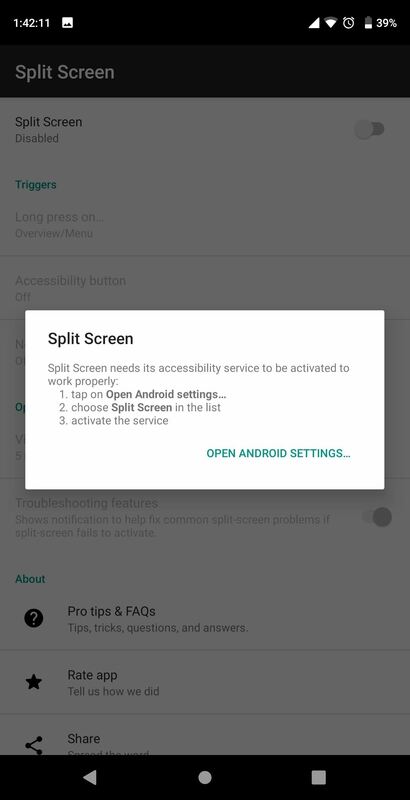 Once in the Accessibility menu, find and select "Split Screen Shortcut." Enable the toggle, then select "OK" on the popup to activate the service. Now, split-screen mode only requires two steps to activate. With an app open, long press the recent apps button to enter split screen mode. Choose a second app on the Overview screen, then you will have successfully cut your screen in half, with two apps on either side. With split screen and the return of your navigation buttons, it's a lot easier to enjoy Android's built-in multi-tasking. Does this workaround make you hate Android 9.0 Pie less? Let us know in the comments below.